Except as otherwise noted, all Web addresses mentioned were functional as of 9-21-18. From the Cumberland Gap to the Atlantic Ocean, this is Virginia Water Radio for the week of September 24, 2018. This week, that sound of the Smith River at Jacks Creek Covered Bridge in Patrick County, Va., opens an episode about fish in schools, but in this case, it’s human schools. Have a listen for about 60 seconds to a guest voice, and see if you know what learning program about finned creatures is taking place. And here’s a hint: it starts in a classroom and ends up getting students out. If you guessed, Trout in the Classroom, you’re right! You heard Krista Hodges, the education manager for the Dan River Basin Association, giving a trout life cycle presentation in February 2018 at Patrick County’s Woolwine Elementary School, and then leading Woolwine students in releasing trout fingerlings into the Smith River in April 2018. The Association coordinates the Trout in the Classroom program in southern Virginia, while chapters of Trout Unlimited, the organization that began the program, bring it to schools in other parts of Virginia and across the United States. For over 20 years nationwide and over 10 years in Virginia, the program has helped provide elementary, middle school, and high school students with learning experiences about fish and other aquatic organisms, water quality, and local watersheds. Thanks to Krista Hodges and to students at Woolwine Elementary School for making the recordings used in this episode, and we let two Woolwine 7th-graders have some closing words about the value of the Trout in the Classroom program. 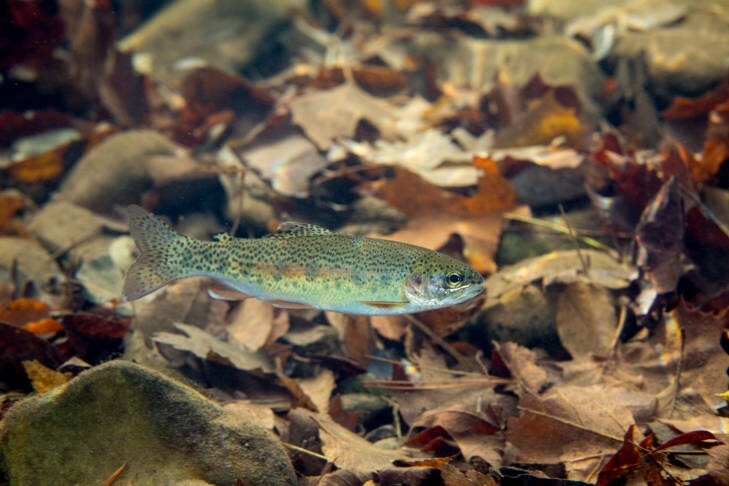 The Trout in the Classroom in-school sounds were recorded by Krista Hodges in February 2018 at Woolwine Elementary School in Patrick County, Va. The trout-release sounds were recorded by Ms. Hodges on April 10, 2018, at the Smith River at Jacks Creek Covered Bridge, also in Patrick County, near the school. Virginia Water Radio thanks Ms. Hodges and students at Woolwine Elementary School for recording these sounds and allowing their voices to be used in this episode. The two photos immediately below show Woolwine Elementary School students releasing trout fingerlings into the Smith River in Patrick County, Va., on April 10, 2018. Photos by Krista Hodges, used with permission. The three photos immediately below show the three species of trout found in Virginia waters: Brook Trout, Brown Trout, and Rainbow Trout. Brook Trout is the only native species; the other two species are widely established. Brook Trout. Photo by Ryan Hagerty, made available for public use by the U.S. Fish and Wildlife Service's National Digital Library, online at http://digitalmedia.fws.gov, accessed 9-24-18. Brown Trout. Photo by Robert Pos, made available for public use by the U.S. Fish and Wildlife Service's National Digital Library, online at http://digitalmedia.fws.gov, accessed 9-24-18. Rainbow Trout. Photo by Ryan Hagerty, made available for public use by the U.S. Fish and Wildlife Service's National Digital Library, online at http://digitalmedia.fws.gov, accessed 9-24-18. 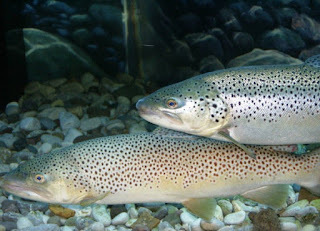 The following information is from the Virginia Department of Game and Inland Fisheries, “Trout Management Program,” online at https://www.dgif.virginia.gov/fishing/trout/. “Trout management in Virginia consists of three basic programs. “The Catchable Trout Stocking Program (online at https://www.dgif.virginia.gov/fishing/trout/catchable-trout-stocking-program/) is the best known and most popular. ‘Designated Stocked Trout Waters’ are stocked from October through May with catchable-sized trout. See the Trout Stocking Plan (online at https://www.dgif.virginia.gov/fishing/trout/) for the streams and lakes stocked and their stocking schedule. “The Wild Trout Program (online at https://www.dgif.virginia.gov/fishing/trout/wild-trout-program/) includes the management of reproducing populations of brook, rainbow, and brown trout. 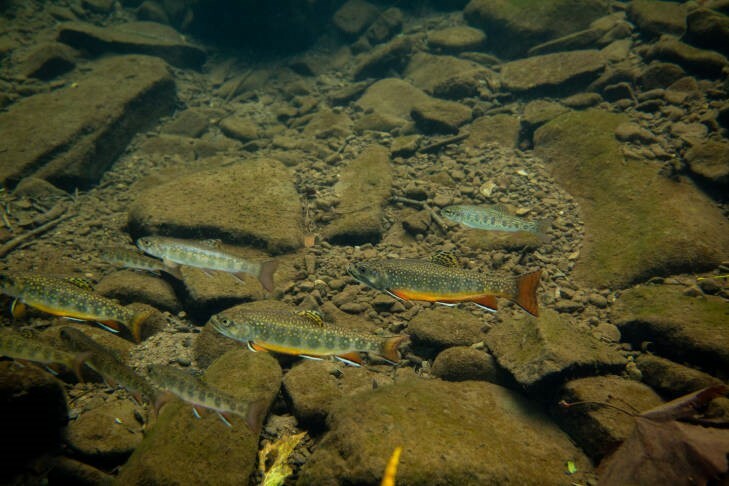 Efforts are directed primarily at habitat preservation and proper regulation for protection of spawning stocks. Dan River Basin Association, online at http://www.danriver.org/programs/environmental-education/for-educators. Information on the DRBA Trout in the Classroom program is online (as a PDF) at http://www.danriver.org/content/danriver/uploads/infoabouttroutintheclassroomforwebsite.pdf. Sara Gregory, Tiny trout make a giant leap from classroom tank to Roaring Run, with a little help, Roanoke Times, 4/12/17. 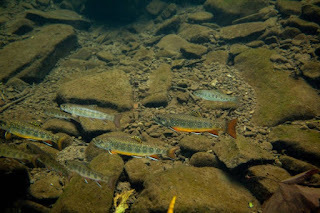 Trout Unlimited, “Trout in the Classroom,” online at http://www.troutintheclassroom.org/. Trout Unlimited Chapters in Virginia, online at https://www.tu.org/connect/chapter-search?name=&city=&state=VA&proximity=25&zip=&commit=Search. Virginia Council of Trout Unlimited, online at http://virginiatu.org/; their “Trout in the Classroom” page is online at http://virginiatu.org/education/trout-in-the-classroom/. Virginia Department of Game and Inland Fisheries, “Trout Fishing Guide,” online at https://www.dgif.virginia.gov/fishing/trout/. Virginia Department of Game and Inland Fisheries, “Virginia Fishes,” online at https://www.dgif.virginia.gov/wildlife/fish/. This site has links for Brook Trout, Brown Trout, and Rainbow Trout. All Water Radio episodes are listed by category at the Index link above (http://www.virginiawaterradio.org/p/index.html). See particularly the “Fish” subject category. Following is a link to another episode on the Smith River. Episode 360, 3/20/17 – Who Were Smith and Philpott and What Do They Have to Do with Virginia Water? This episode may help with the following Virginia 2010 Science SOLs. 2.1, 3.1, 4.1, 5.1, and 6.1: Current applications to reinforce science concepts.